This chick deserves her own blog entry. I’ll start by saying that she was my least favorite chick when we first brought the girls home. She was small and black—the least visually interesting of the three. Daisy was a beautiful golden-yellow with a round fluffy shape, and Rosie had amazing eyes and a pattern of four colors on her striped and spotted little body. Violet..well, she was small and black. In less than 24 hours however, this little girl had me completely charmed. She pushed her sisters out of the way for the food trough (I’m the oldest of three girls and my sibs might describe me in much the same vein), ran to the front of the cage when she saw me, and she was the loudest and most active. Later, as she grew, she learned that if I approached the cage with my hand out, there would be a wiggling treat. She has NEVER let either sister get a first taste! She’s almost always first out of the cage in the morning (Rosie sometimes, Daisy never) and she runs the fastest, flies the highest (almost two feet! ), and chirps the loudest. Are these admirable qualities in bird or human? Perhaps not, but she has endeared herself to me nonetheless. 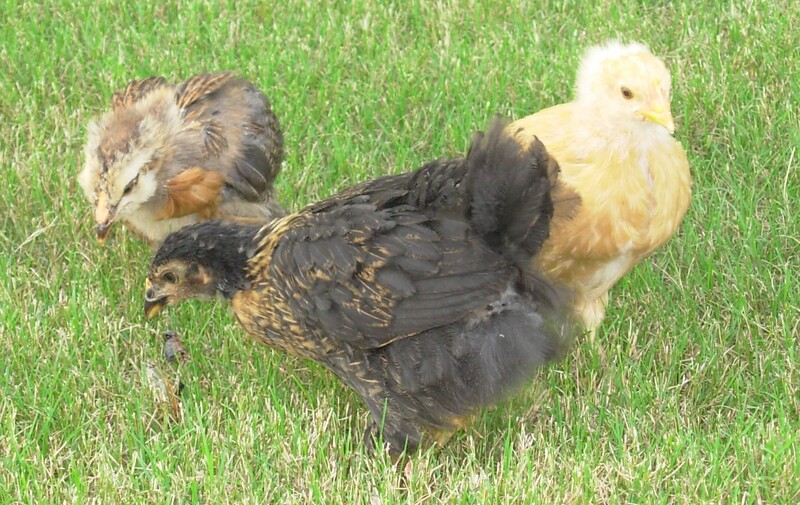 In reading about raising chickens, many of the books warn that there is indeed a pecking order and that sometimes a chicken can bully her sisters to injury and sometimes death. Often an aggressive chick seeks out weaker ones to peck and push and chase until isolation of the tormented bird becomes necessary. This is not the case with Violet. 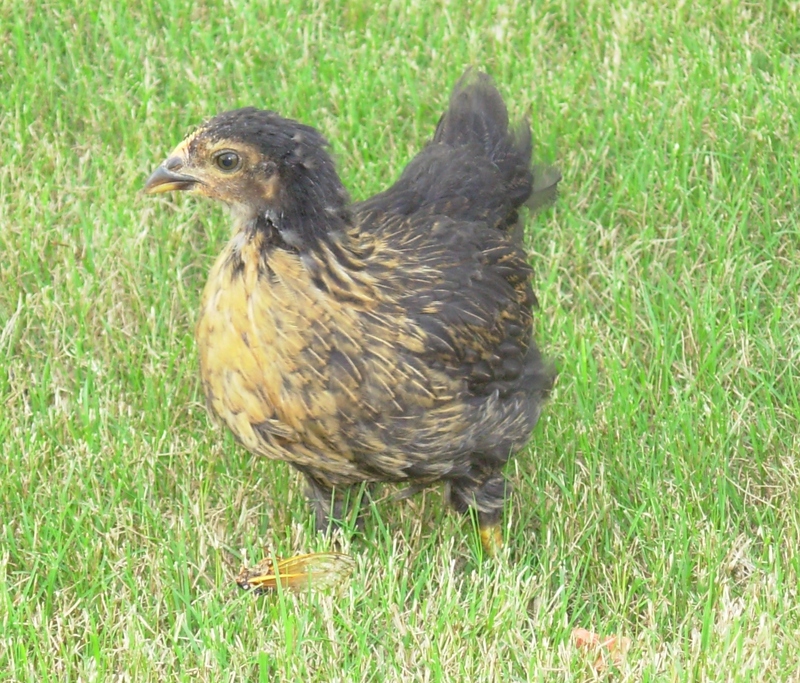 She is an aggressive little girl, but she has never pecked either of her sisters and I have even seen her “groom” them on occasion. At night when it is time for bed, she, Daisy and Rosie snuggle together in the corner of the cage and sleep in a multi-colored pile of fluffiness. It makes me smile and breaks my heart just a little bit. There is good in even the most bossy and selfish of us all, (JoAnn, Robin, are you paying attention? ) and there is room on this earth for birds of every feather. Love your chicken stories, Debbie! 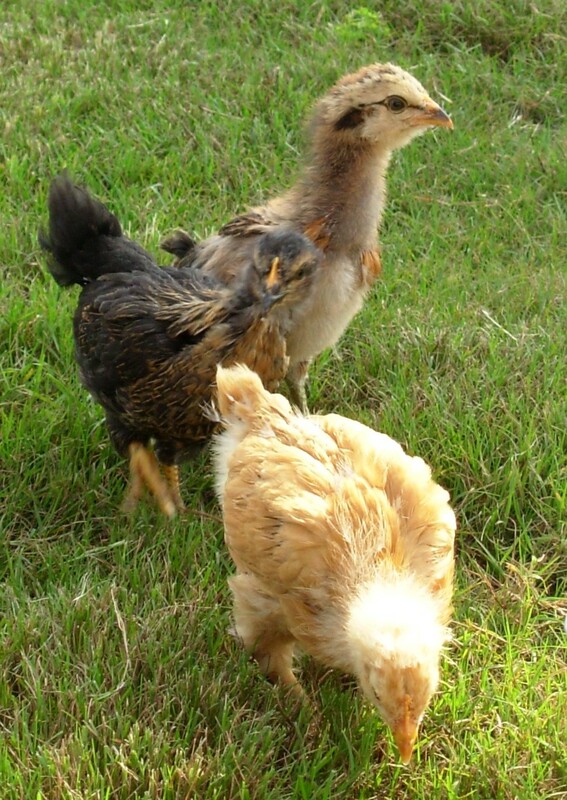 I was in 3 different pet stores in GA yesterday – looked at all kinds of birds, but I was wishing for charming chickens! Marcia, I’ve loved most animals all my life but I never understood some folk’s devotion to birds! I thought, “What is the attraction?? ?” I get it now. These little girls are as funny and entertaining as cats and bunnies. Who knew?